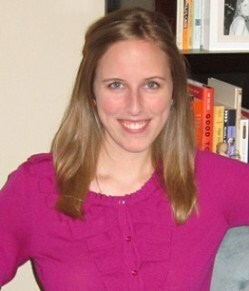 You may notice that the blog design got a little makeover... the background is now polka-dotted! It's a fun, fresh look for the new year. 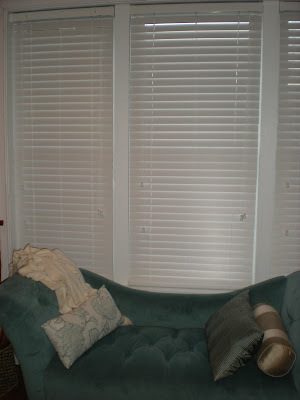 Another makeover also took place this weekend: we installed new blinds (with the help of Scott's dad)! Our old blinds were ugly (thin, flimsy, dirty)... and before we had a chance to replace them, they started to break completely. The broken, crooked blinds in the living room looked horrible, so we took them down and draped a sheet across the whole window for a little privacy since we face a busy street. 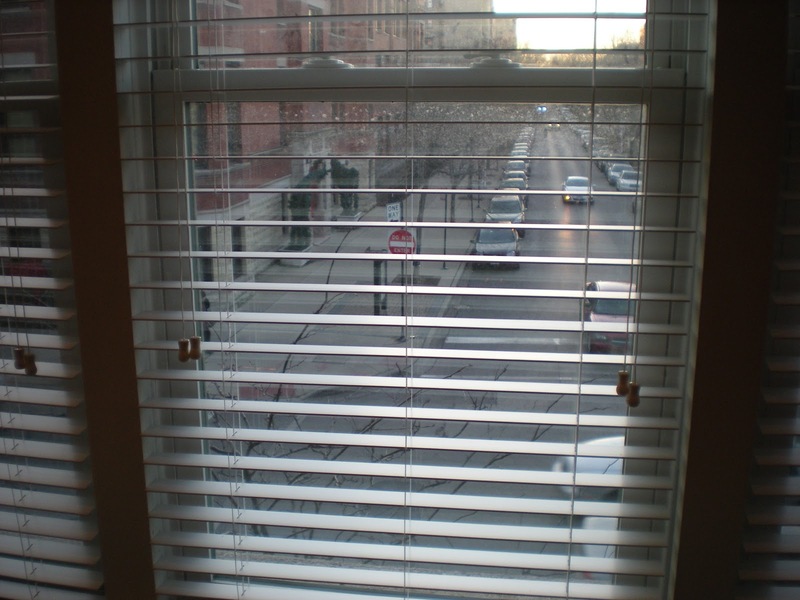 But now, we will no longer have to stare at the brown-striped sheet or peek around it to look outside. 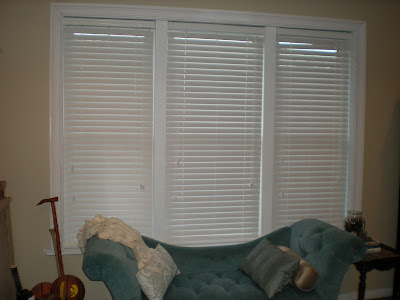 We ordered these beauties from Blinds.com, per the recommendation of my parents. They had recently replaced all the blinds in their house and told me that the price, quality, and ease of ordering and installing from Blinds.com was fantastic. I can agree completely. 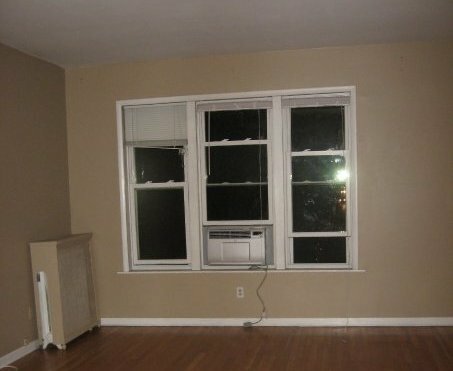 I never thought I would get so excited about something as boring and basic as blinds, but they truly make a difference. After ordering a couple color samples and doing some comparison shopping, we decided on the 2-inch faux wood "economy" blinds in a clean white color. We placed an order online... they have super easy instructions on measuring and there is a sizing guarantee, so you can exchange your order if you happen to measure incorrectly (made me feel much better!). The blinds arrived quickly, despite a slight backorder of about a week, and Scott and his dad installed them while I was at yoga today. During yoga, I was thinking about how the weather has been so pleasant for January and how the sun has actually been out, which definitely has a positive effect on my mood. I hadn't exercised or stretched in weeks, so it felt good to move in the sunny studio... an awakening of my muscles, breathing deeply to bring oxygen into my body. If you're interested, email me at inspirationandroughdrafts [at] gmail [dot] com and I'll send you a referral email for $10 off your order of $150 or more. I was not compensated for this post; just wanted to share my experience. 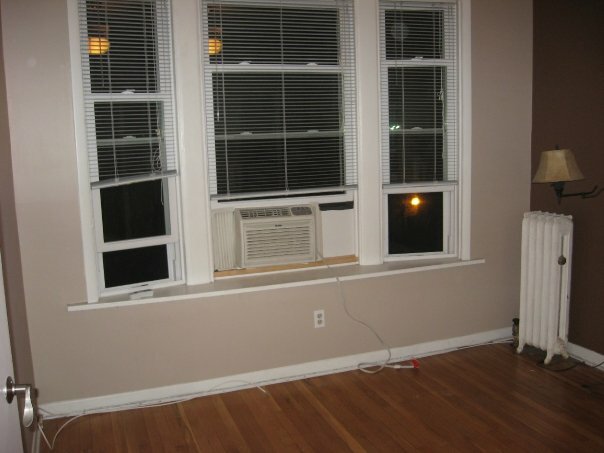 Update: Per my mom and sister's request, here are some "before" pictures of our old blinds. Since the picture of the living room doesn't give the best view of the blinds, I also included a "before" shot of the master bedroom window. Enjoy! Wow they look amazing! It makes a world of difference. Julie mentioned that it would have been fun to see before and after pictures. I rememeber what it looked like before so can appreciate the dramatic change. Your new blinds look great Congrats- Scott- great job!